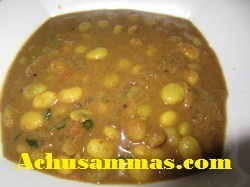 · Pressure cook butter peas with salt,turmeric powder with little water and keep it aside. · Meanwhile roast the coconut, 2 tbsp onion, garlic until coconut become brown in color. · Finally add coriander powder, red chilli powder, garam masala powder and roast for 1-2 minutes. Grind the above roasted coconut mixture with water and make a smooth paste. 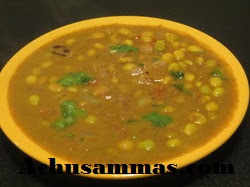 · Heat oil in a pan and add mustard seed,when start to spluttering add onion and sauté till onion become transparent. · Add the tomato, sauté for 2-3 minutes. · Add the ground coconut paste into mixture and sauté for 2-4 minutes. 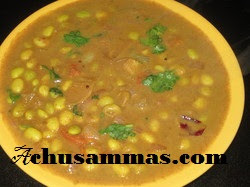 · Finally add the cooked butter peas and close the lid, cook it for 5-10 minutes. · Garnish with coriander, curry leaves. Delicious and protein rich curry. Serve me this and I'll opt for the roti to go with it..yummy. Delicious curry. I love coconut! Yummy and healthy curry,love it. 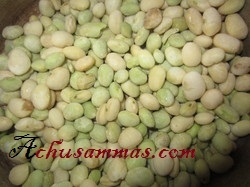 Very delicious..love to have with rotis!! All time combo for Rotis..... Yum !! !